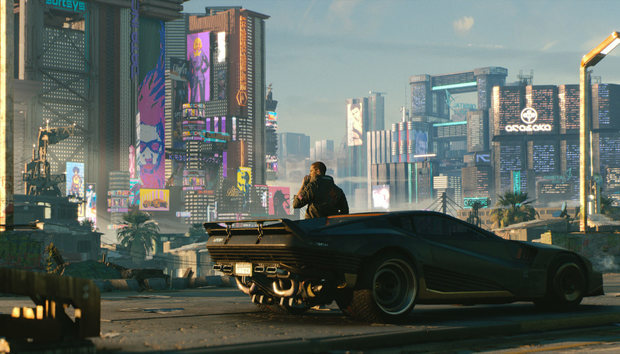 That’s how CD Projekt, the studio behind The Witcher series, opened our presentation of Cyberpunk 2077 at E3 2018, and...well yeah. So far, so Cyberpunk. And yet while the tropes may feel familiar, it quickly became clear to me that the game itself is anything but. 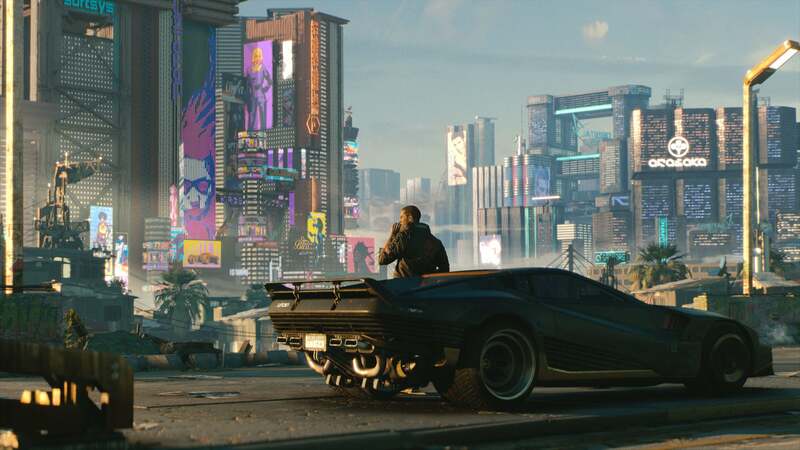 Straight up: Cyberpunk 2077 is the most impressive game demo I’ve ever seen. Our demo was strictly hands-off, but in typical CD Projekt fashion was also very meaty—almost an hour of the game, played for us by one of the developers. We couldn't record it, so we've embedded the trailer above. Listen, I’ve played a lot of video games in my life. Almost 30 years of them at this point. I know what a “city” looks like in video games, and I’ve watched that definition evolve over the years. I remember when Morrowind’s towns seemed bustling, and Oblivion after that. I remember watching a trailer for the original Assassin’s Creed and being stunned how large and crowded it was. I remember driving around Grand Theft Auto V and being in awe of the traffic and the number of unique pedestrians. So I’m deadly serious when I say: I didn’t think Night City was possible. Not yet, at least. I literally didn’t think the technology existed. What I saw during CD Projekt’s demo was astounding. At this point, I should probably mention that Cyberpunk 2077 is played in first-person. That means it’s even harder to convey a sense of scale to the player. As we walked out of that apartment, I was stunned as we looked up at towering skyscrapers, dozens of them stretching off into the distance and dotted with billboards and storefronts and all sorts of other signs of life. It felt like an actual city street, something from Manhattan or downtown Los Angeles or Tokyo or some other urban megacomplex. And the people. The people! Dozens if not hundreds of NPCs casually milling about. Not just walking, but doing things—stopping to look at stores, or talk to each other, in ways that seemed entirely natural. One boxed with an android in a back-alley ring, while onlookers crowded around. These aren’t the robotic schedules I’m used to from Skyrim or Fallout 4, or even The Witcher 3. I’d say Assassin’s Creed: Origins got closest, but even it pales in comparison to what I saw during this Cyberpunk demo. Night City felt like a living, breathing place. Whether that illusion holds up over 80 or 100 hours? I can’t say. 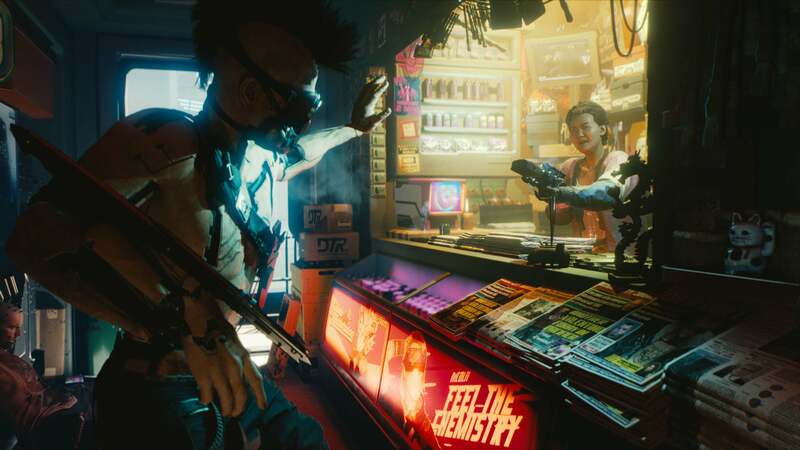 But in the hour we spent with Cyberpunk 2077, I never grew tired of simply walking around, taking in the sights and sounds. There’s a realism to Night City I’ve never seen, and again: I didn’t think it was possible. I mention it first, and I spend so much time on it, because it contextualizes so much about Cyberpunk. From the moment you see those people milling around, you realize the attention to detail—and then you notice it everywhere. In the ads and signs that plaster the walls, in the way the bullets tear through plaster trailing little lines of dust. Even in V, your character. For instance, to upgrade your skills you need to go to a Ripperdoctor—someone who specializes in implants. Nothing is abstracted, though. You want an eye implant? You’ll watch the Ripperdoctor lean in to pull your existing, organic eye out (in first-person) and then see the mechanical eye flicker to life. And don’t forget to take your post-operation meds. Anyway, the demo took us through two missions. The first, which opened the demo, had us infiltrating a “Scavenger” apartment. These monsters are kidnapping people off the streets and harvesting their cybernetic implants for cash, then tossing the bodies. It was our job to rescue one of their targets, a woman we found naked and on ice in a bathtub—but still alive. After taking out all the Scavengers, we removed the virus infecting her locator chip and handed her over to the Trauma Team, which was described as “high-end medical insurance for rich people.” They looked more like another mercenary squad, dragging her into an ambulance while keeping their guns trained on us. 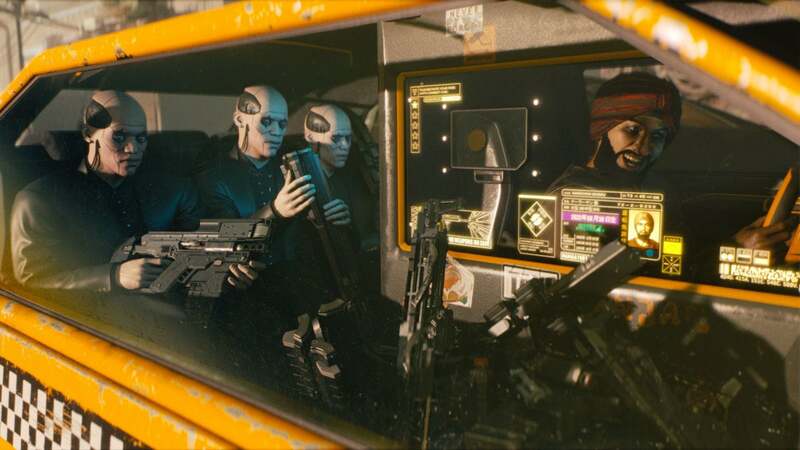 The other mission was much more involved, tasking us with crossing the city to talk to a mysterious agent—who turned out to be part of Militech, a megacorporation. She was angry because V’d done some work targeting Militech in the past, and in lieu of killing us, hired us to take revenge on another gang. Our goal: Get them to insert a virus-ridden credchip into their computer system. Of course, Militech double-crossed us. After a tense haggling scene and the promise that we weren’t there to screw them, they plugged in the credchip and...oh yeah, all the lights went out. At that point, Militech was supposed to come to our rescue, but instead we had to fight our way out of the gang’s base. 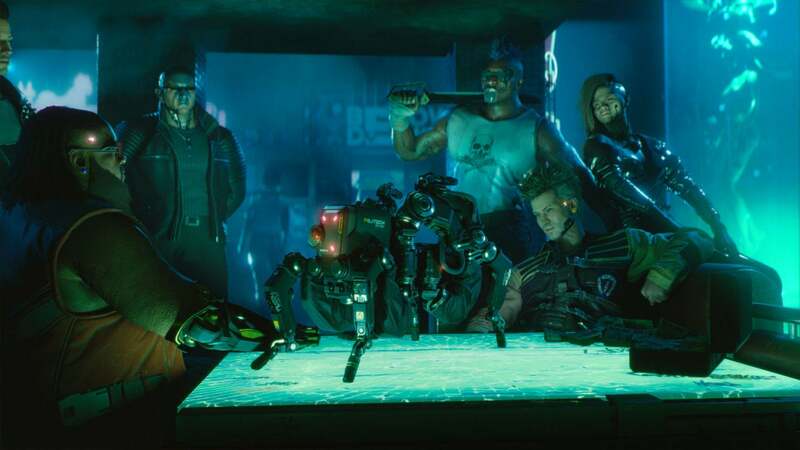 It was a lengthy combat sequence, and while that’s certainly not the part of Cyberpunk 2077 I’m most interested in, it was still pretty impressive. The shooting looks tight, and V has all sorts of fancy abilities. She can slow down time, bounce bullets off the walls, see enemies through cover, hack into enemy’s heads and deploy viruses, and more. You have options. 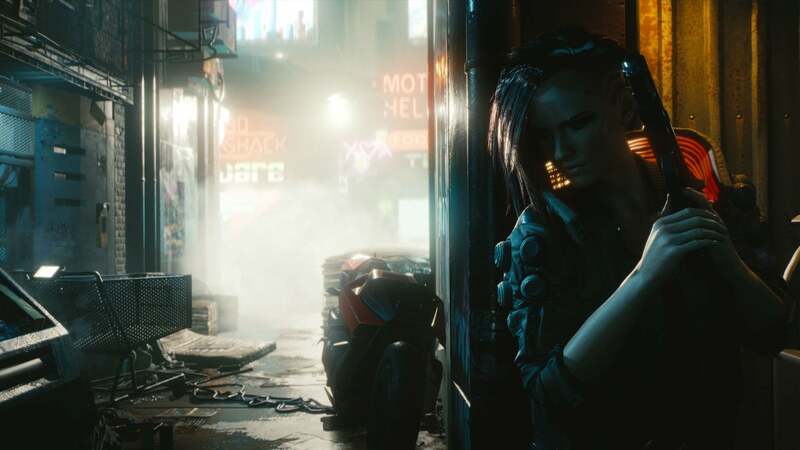 Cyberpunk is a classless system, and so it’s up to you to mix and match the various skills, spec towards being a gun-happy tank character or a tech-centric assassin or what have you. At one point in the demo, our companion lifted up an entire car to create cover. I’m hoping that’s an unlockable feat. I don’t know. It seems fun. 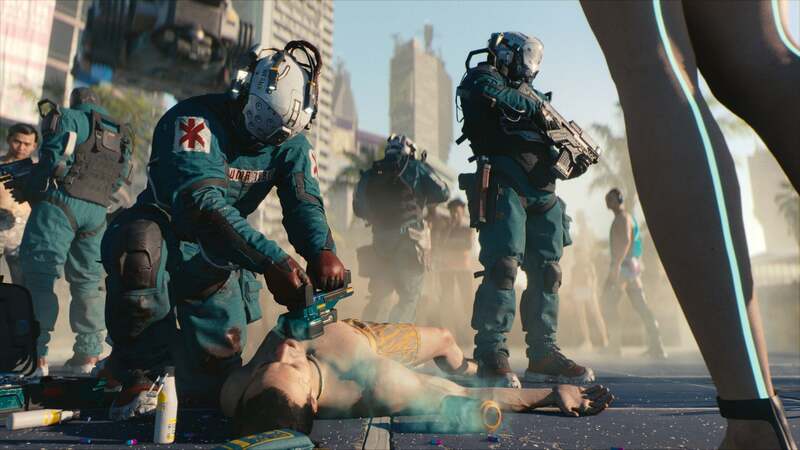 Combat was never really The Witcher’s strong suit, even at its best in The Witcher 3, but what I saw of Cyberpunk 2077 looked better than quite a few actual first-person shooters I’ve played recently. Creative guns, a wide range of skills, and a lot of panache. Again, cyberpunk tropes. But if there’s any studio I trust to make a hackneyed genre interesting again, it’s CD Projekt. After three spectacular games, with some of the best writing the industry’s ever produced, it’s hard to argue they haven’t earned that. The question, I guess, is whether this E3 demo is at all indicative of what we can expect from the final game. As I said, there are a lot of aspects here that I thought were not possible right now. Aspects that, were any other studio to put them in an E3 demo, I’d argue were far-fetched. I remember seeing a demo of The Witcher 3 back in 2013 though and having that same “They can’t possibly pull this off” feeling. And while The Witcher 3 did change quite a bit before release, it was mostly minor nitpicks—I remember forum threads about the stone walls being less detailed. The core of The Witcher 3, the parts I thought were impossible, ended up just as CD Projekt said. So I don’t know. I’d certainly like to believe that everything I saw in this Cyberpunk 2077 demo was real, not just part of some elaborate “vertical slice” hoodwink. Because as I said, this is the most impressive demo I’ve ever seen. And if CD Projekt can make the game that CD Projekt claims it’s making? The game it showed to us? We’re all in for a real treat.